29/10/14 Time clock & PE control in one unit! 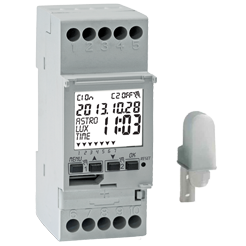 Over the years we have seen so many projects that required certain lighting circuits to be controlled in conjunction with a time clock as well as a PE cell, which has involved a complicated wiring process to achieve the required functionality. But now Smartscape has the simple answer! A 2 channel Astronomical time clock that uses a remote light sensor that can be programmed to switch based on astronomical settings (sunset & sunrise), a specific time or based on light level or a combination of all of them. Lights switch on at sunset which is automatically calculated based on the installations geographic coordinates and are then turned off at say 10pm, however for safety, on a very overcast day when the light level drops below a certain point the lights will also turn on.